I am a 31-year old woman. My husband, 35, is using clear aligners to have his teeth straightened because he didn't want braces. Will they work for me too? Great question! Clear aligners are an alternative system to traditional braces that use a sequence of individual clear, removable “trays” to gradually straighten teeth. The alignment is accomplished with a series of trays each made of clear almost invisible plastic that completely cover the teeth; each tray is slightly different, and when worn for 20 hours a day for two weeks before going on to the next set in the series, will move the teeth into an improved position. The trays are computer-generated based on proper records and diagnosis of your specific situation. Results can vary widely depending on the skill and experience of the orthodontist or dentist, as well as the patient's compliance with continually wearing them. Clear aligners are an alternative system to traditional braces that use a sequence of individual clear, removable “trays” to gradually straighten teeth. Total treatment time can range from six months to two years. When treatment is well-planned, clear aligners can successfully realign or straighten teeth, close mild spaces, treat elongated teeth and tip teeth into better position. Generally speaking, clear aligners should only be used for adults instead of children. Many adults like your husband prefer this system since the trays can be removed for important social events and occasions. 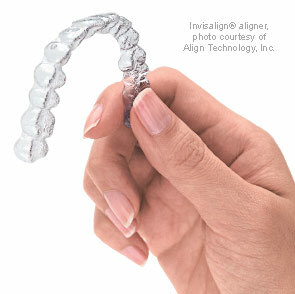 Orthodontics using clear aligners is not for everyone and its application will depend on your particular situation. The first step is a proper “orthodontic” diagnosis or assessment of your individual situation. This assessment should be performed by an orthodontist or a dentist with advanced training and experience in orthodontics. The assessment will consist of appropriate and specialized radiographs (x-rays) of the teeth, jaws and skull, along with photos and impressions, to make models of your bite. All this information is used to determine if orthodontics using clear aligners is right for you. The primary factor in deciding whether you can use the system will depend on whether your teeth can be moved without compromising your overall dental heath. The system is usually recommended for correcting mild to moderate crowding or spacing of teeth. It's ideal if you have a good “bite” — meaning your back teeth already fit together properly. With a good bite, biting forces distribute evenly on all of your teeth, which also protects the health of the supporting periodontal structures, the gums and bone. With a bad bite, forces are uneven, creating uneven wear and instability of the tooth position. If clear aligners are improperly planned, bite problems can develop. Another side effect (not unique to this system) involves cases where “recession” (shrinking of the gums) can occur by tipping teeth too far out of the bone in an attempt to make them straight. There are other cases where the back teeth don't fit together properly after inadequate treatment planning. Again, problems can occur with any orthodontic treatment if it is not planned and/or applied correctly. For some moderate to severe crowding or spacing, or more complex cases, this system may not be the treatment of choice. Traditional braces may be necessary in cases where the bite is really off such as when the teeth in the upper and lower jaws don't meet well, creating too much overbite or even under bite. An underlying skeletal discrepancy (the jawbones don't line up properly) may also indicate that braces may be the better treatment option. That being said, assessing a “malocclusion” (poor tooth or bite alignment) is complex and must be fully understood in order to choose the right treatment option. There are several movements that are difficult and less predictable with removable clear aligners, like closing extraction spaces, uprighting teeth, opening severe deep bites, rotating, torquing or other more complex movements requiring more sophisticated techniques. These movements are easily accomplished with traditional braces; however, with careful treatment planning and “staging” of clear aligners, experienced practitioners can successfully accomplish many of these finishing movements. Orthodontics with clear aligners is not a one-size or one-price-fits-all treatment. Ultimately, the final results depend heavily on who treats you — which may vary from one doctor to another. In reality, orthodontic treatment is art as well as science. Treatment planning cases and moving the teeth efficiently and realistically is based on careful and proper diagnosis and experience. Another factor with clear aligners is that some systems are not using computer generated movements and are poor imitations of the most recognized, state-of-the-art clear orthodontic aligning system used in dentistry today. Ask your dentist about which system is recommended.